Not posted anything for some time. Light nights, holidays, QHY8L broken, pondering what changes need to be made for the new season of astrophotography......etc. So my QHY8L died and although I stripped it down, there was nothing obviously wrong - I suspected the dodgey DIN connector, but it wasn't that. So off it went, via Bern at Modern Astronomy to China to be repaired. It's been fixed I understand and should be back soon. I was hoping to have more time/success with my twin scope set up, so I've been making some improvements. I've added a 4 port USB 3 hub and cable to replace 4 separate USB 2 cables. The theory being USB 3 cables should be better quality. First impressions look good, but time will tell. 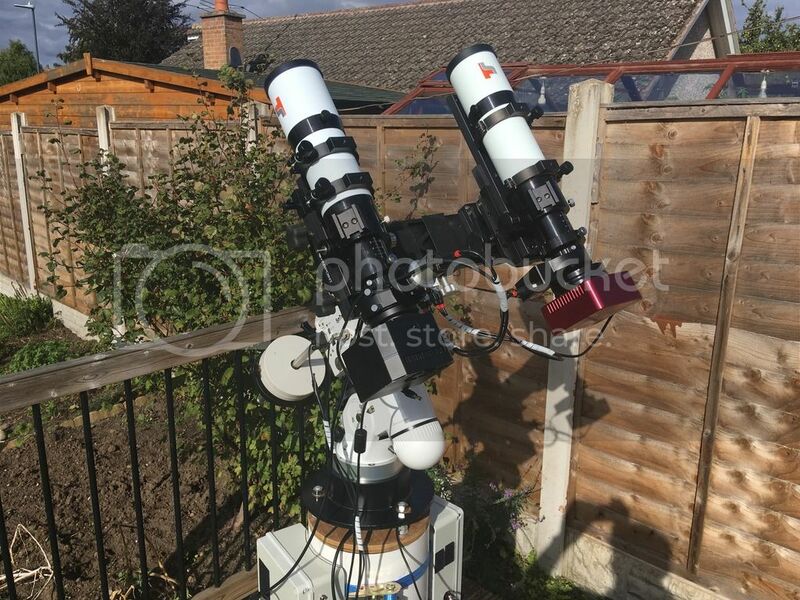 Also purchased a new camera, a second hand Atik 383L+ as this will match the sensor in the Moravian G2-8200, which the QHY8L didn't when I used that. That should simplify the processing of the images and hopefully give a better result. To this I've added a ZWO mini EFW. This should allow me to maximise my imaging time. Might swap the filters around a bit, might make sense to split up the RGB to allow LRGB imaging only to be set up. Looking forward to some clear skies.